The 2016 NBA season should be officially known as the Russell Westbrook Revenge Tour. The Oklahoma City Thunder point guard has taken no prisoners this season as he has shown the entire league that this is his team and that he does not need Kevin Durant. Without Durant this season, Westbrook has taken his game to new heights, becoming a triple-double machine on a nightly basis. On Friday night against the Boston Celtics, Westbrook put together another triple-double performance consisting of 45 points, 11 rebounds, and 11 assists to lead the Thunder to a 117-112 comeback victory. From the onset, Westbrook came out playing with a high intensity, not only scoring the basketball, but also getting his teammates involved. His teammate, rookie big man Domantas Sabonis helped on the scoring side of things on Friday night, scoring 20 points on 8-of -11 shooting from the field. However, when the Thunder needed a basket, Westbrook did what he does best, which is score the ball at will. Westbrook not only did this by attacking the rim, but he also knocked down a couple three-pointers. With 45.4 seconds to go in the first half and Thunder down 54-51, Westbrook knocked down a three-pointer in the face of Avery Bradley to tie the game up at 54-54. Nevertheless, Westbrook was not done in the first half as he put extreme pressure on the Celtics’ defense to try and stop him in the open court. In the second quarter alone, Westbrook scored 14 points on 5-of-9 shooting from the field, along with 2-of-3 shooting from three-point range, and five rebounds. Then in the third quarter with Celtics guard Marcus Smart guarding him, Westbrook took advantage and was knocking down mid-range jumpers. When you take a look at his shooting splits this season, Westbrook is shooting 43.1 percent between 10-16 feet. But as aforementioned, when the Thunder needed a bucket, Westbrook took over. Late in the fourth quarter, Westbrook drove to the rim at will. The Celtics’ guards simply did not have no answer for him. Westbrook only knows one speed and when he gets a full head of steam, you might as well say your prayers because he’s not stopping. This season, at the rim, Westbrook is shooting 57.9 percent, which is absurd. His ability to get to the basket may remind you of former Sixers and Hall of Fame guard Allen Iverson. Both play with reckless abandonment and only have one goal in mind: score by any means necessary. That by any means necessary mindset helped Westbrook on Friday night as with the Thunder only up 107-104 with 1:13 to go, they needed a basket. 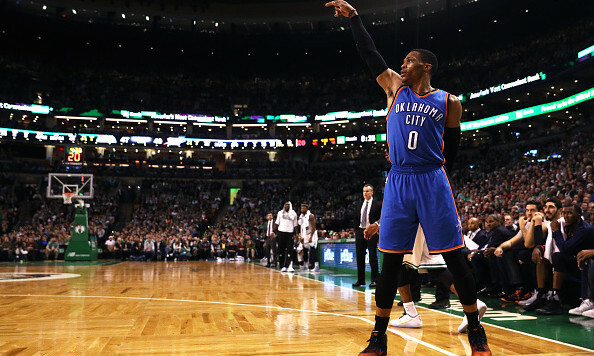 That much-needed basket came in the form of Westbrook, shooting two back-to-back dagger three-pointers in the faces of Bradley and Smart to sink the Celtics at TD Garden. Matter of fact, in the fourth quarter this season, Westbrook plays his best basketball as he is shooting 45.4 percent from the field and shooting 39 percent from three-point range. Then not to mention, with less than six minutes in a game, he is shooting 46 percent from the field. With his latest triple-double, it now gives Westbrook 14 for the season. He also had the second highest point total (45) by a visiting player ever in TD Garden history. The only player to score more than him was Iverson with 48 points on Jan. 25, 2002. More importantly outside of Westbrook’s triple-double, the Thunder got their second-straight victory on the road. For the Thunder to have any chances of making the playoffs, Westbrook needs to continue to play out of his mind and if he does, there is no reason why he won’t be this season’s MVP.